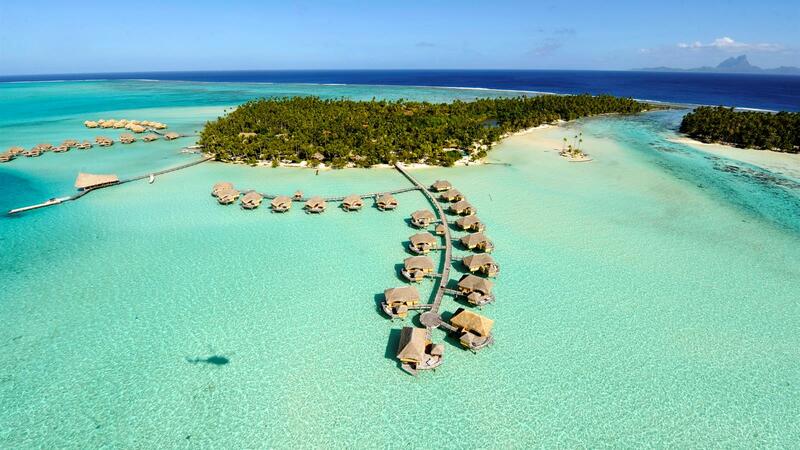 Enjoy 3 magical nights on Moorea: the "Magical Island" at the Intercontinental Moorea, 3 nights at Le Meridien on Bora Bora: the "Romantic Island" and then 3 nights on Taha’a: the “Vanilla Island” at the prestigious Relais & Chateaux association' member; Le Taha'a Island Resort & Spa with Full Breakfast daily, a Tahitian Black Pearl gift, VIP Status including a Welcome Letter from the General Manager, Chef's special Treats in your bungalow on arrival and a 5000 XPF Resort Credit to use during your stay at Le Taha'a and special and special Hotel Anniversary Bonuses such as Champagne or Tropical Flowers. International and Inter-Island Airfare round trip and Airport Transfers included. Tiki Village Dinner & Show Moorea, Shark & Ray Feeding, Snorkel Safari on Moorea. Dinner at Bloody Mary’s Bora Bora, Shark & Ray feeding Bora Bora, 4WD Bora Bora. On Taha’a: Overland 4WD Safari Tour, ATV Adventure Tour, Lagoon Safari, Raiatea Discovery Tour, Jet Ski Tour with local guide. For a complete list of recommended Excursions on Moorea, Bora Bora and Taha’a, please refer to the Excursions page and include your preferences on the Quote Request Form.